Did you know: Besides having several Japanese seiyuu from the series Neon Genesis Evangelion supplying voices in the first season, the cult TV show The X-Files also had several episodes officially adapted into manga form which were collected into tankoubon. 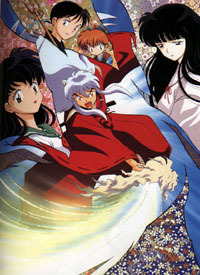 Unlike the official American adaptations, the Japanese versions strive for their own visual style which are not constrained by the need to show exact character likenesses. It's the movie that everyone has been waiting to see. 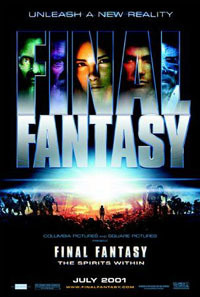 The movie based on one of the best video game series ever created... Final Fantasy. Aki Ross, and her mentor Dr. Sid must collect the eight spirits from around the globe in order to combat the ghosts of a hostile alien planet who have invaded Earth. Goku gets tired of catching giant fish in the river and heads to Master Roshi's for some training. 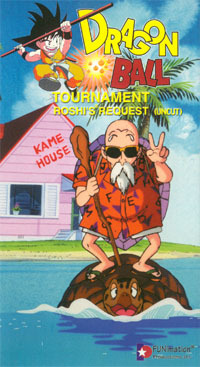 He meets up with Krillin, and they head out to find Master Roshi a date. They bring back a girl named Launch who's sweet one moment and then a psychopath the next–but that's only if she sneezes. If the three can survive this woman's crazy personalities, then they might just be able to find time for some training. 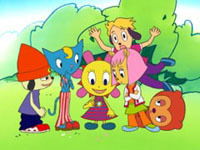 Parappa and friends teleport to a magical world where they help save a romance, and give God the thumbs down. A modern Japanese girl falls down a cursed well at her family's ancient shrine, is attacked by a centipede monster, climbs out of the well to find herself in feudal Japan, sees a cute dog-boy pinned to a tree by an arrow, is attacked by villagers, is attacked by the centipede monster again, finds out the dog-boy is really a dog-demon/boy, finds out that she has some magical jewel that gives monsters power (that the centipede monster wants..), frees the dog-demon/boy from his 'eternal' sleep, watches as the dog-demon/boy kills the nasty centipede monster, and is very surprised when the dog-demon/boy threatens to kill her next if she doesn't hand over the jewel. And this is all in the *first episode*. 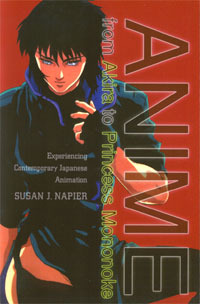 Susan J. Napier paints the latest picture of anime's long standing impact on popular culture. Although the book focuses primarily on anime from the 80's and 90's, it still manages to span the entire genre. It is filled with in-depth looks at specific anime series as well. The author presents one of the most insightful looks at Akira, as well as a number of other series and movies, that I have seen to date. 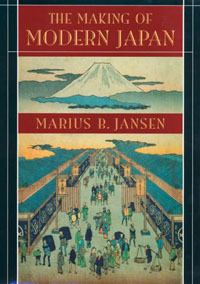 Detailed and skillfully written, The Making of Modern Japan illuminates many aspects of Japanese history, from the Shoguns to the present. If you were ever interested in learning more about the history of Japan, you can't possibly go wrong with this book. The last time Nintendo let someone else create a Zelda game, three of the worst games ever seen were made. 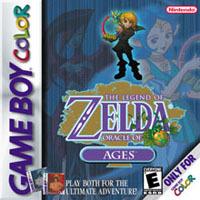 Yet, against all odds, Capcom is able to hold up Nintendo's banner with this latest installment of The Legend of Zelda. Compatibility with other a completely separate adventure only makes the deal sweeter. 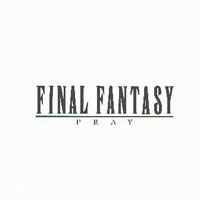 Classic Final Fantasy tracks (from III-VI) arranged Nobou Uematsu and sung by Risa Ohki. For the fan who has it all, it's a wonderful retrospective of the series, but it lacks some very recognizable tunes from these games.